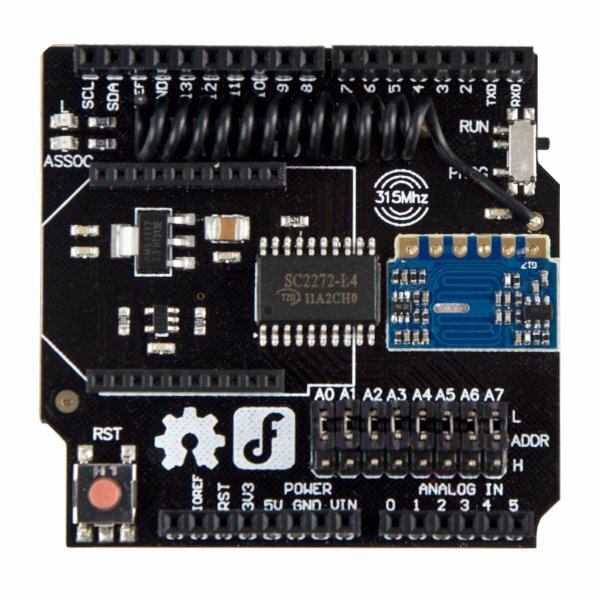 The Wireless 315MHz RF Receiver Shield for Arduino provides an RF command receiver and a standard XBee socket. 315Mhz radios are commonly used for wireless applications such as vehicle monitoring, home security and general remote control. The 315 Mhz radio frequency receiver uses the ASK modulation mode at a maximum of 9.6Kpbs. It only uses about 10mA to receive data and has a sensitivity of about -102dBm for a range up 40M in open spaces. The RF receiver uses the SC2272 remote control decoding chip to latch the received data. This shield uses five Arduino digital input pins to receive incoming data. The shield has a full set of female headers for pin access and shield stacking. 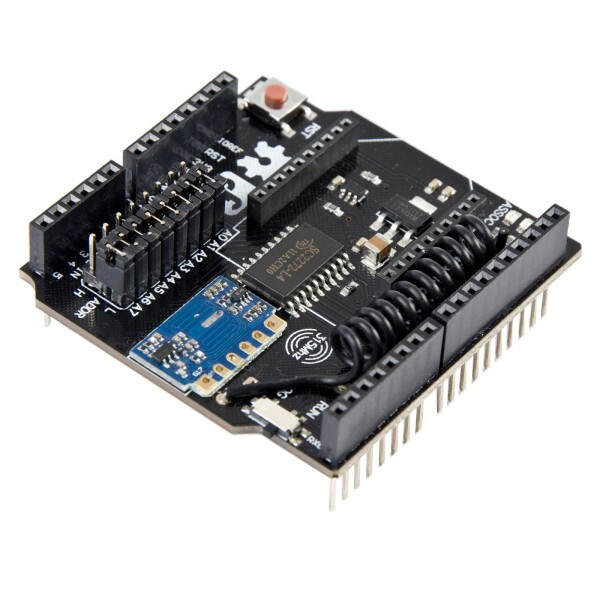 An XBee socket is provided for attaching compatible ZigBee, WiFi and Bluetooth modules for additional functionality. A RUN/PROG switch allows you to use the optional XBee module to program your Arduino wirelessly. A set of 8 jumpers A0-A7 are used to provide a unique RF address for the SC2272 RF encoder. This shield is compatible with the Wireless 315MHz RF Remote Control Keyfob and transmitters based on the SC2262 and similar remote control encoding chips.